App Store software that will be available for download for Apple's iPad when it launches in the U.S. on Saturday can now be viewed through the iTunes Store via the desktop client. Apple has said more than 1,000 iPad-specific applications will be available for download when the new hardware goes on sale April 3. A search for the terms "iPad," "HD" or "XL" in the iTunes Store gives users an option to narrow their search to iPad-only applications. Many of the applications available will be familiar to existing iPhone and iPod touch users, as developers have released new versions of their popular applications formatted for the iPad's larger 9.7-inch screen. 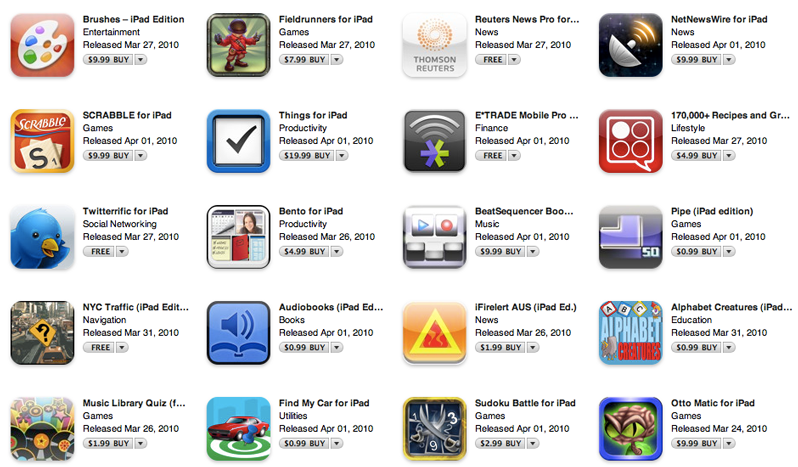 Applications such as "Scrabble for iPad" ($9.99), "Brushes - iPad Edition" ($9.99), and "Twitterific for iPad" (free) can all be previewed through iTunes. The software can also be downloaded for iTunes, and awaits sync with the iPad when it is connected via USB. On Tuesday, Apple released iTunes 9.1, adding compatibility with the iPad and support for syncing of books with the iBooks application. 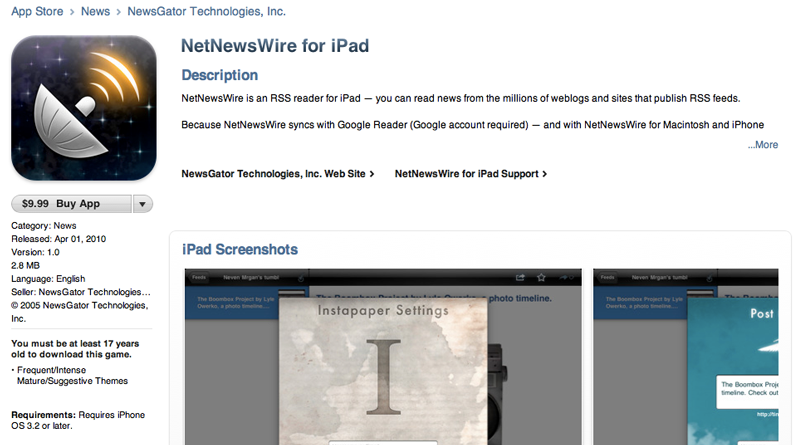 A few weeks ago, Apple began accepting iPad applications for submission to the App Store. Like with the iPhone and iPod touch, all software written for the device must be approved by Apple. Then last week, the Cupertino, Calif., company began approving iPad applications into the App Store, but the software could not be viewed through iTunes. Some software was, however, spotted in the Web-based iTunes Preview list of App Store software, revealing that many developers would distinguish their iPad software with the distinctions "HD" or "XL." In addition to iPad-specific software, the new device will be able to run virtually all of the existing App Store software, which has more than 150,000 applications. The Wi-Fi-only version of the hardware will go on sale in the U.S. this Saturday, April 3.